As Winter’s barren effects and pure white snow surrounds, perhaps there is no month more appropriate than February to present a visual of blushed pink hues. 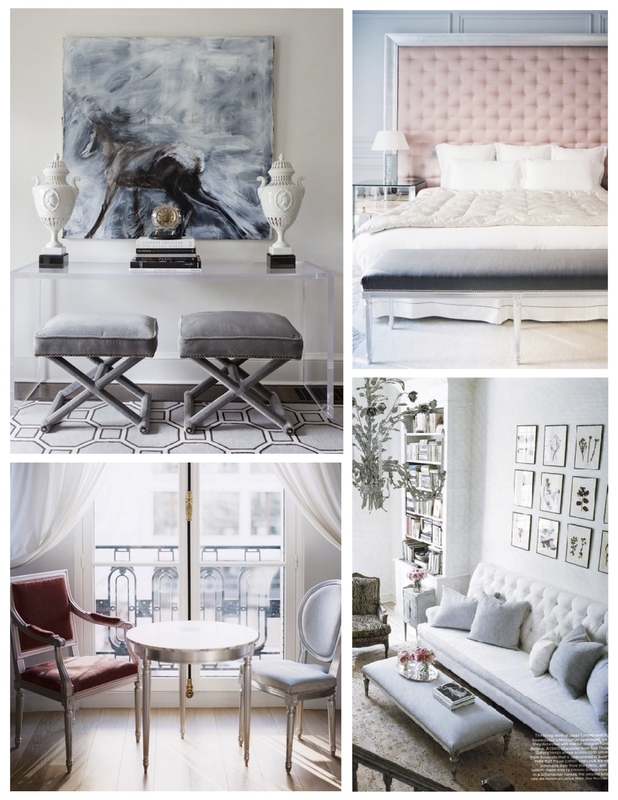 A burst of pale color seems the perfect infusion. 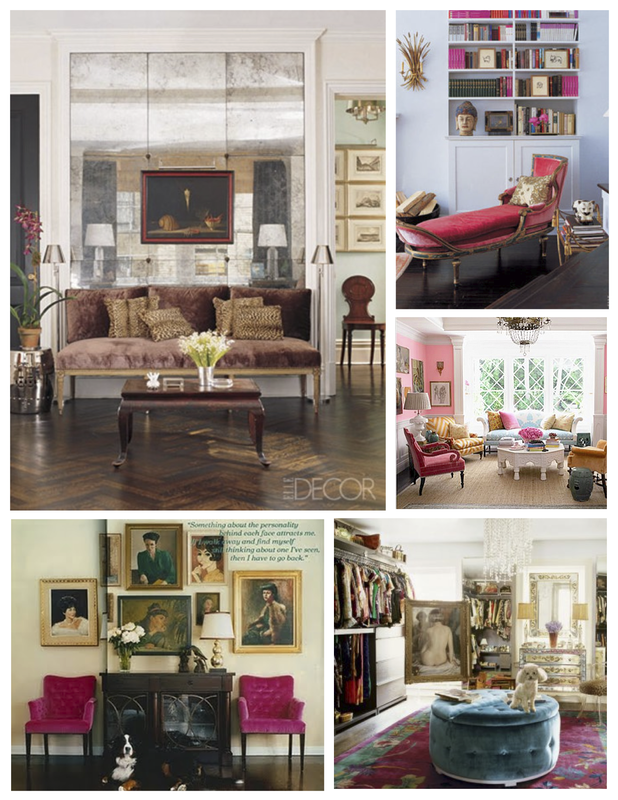 Consider in appreciation the addition of pink to the world of interior spaces. 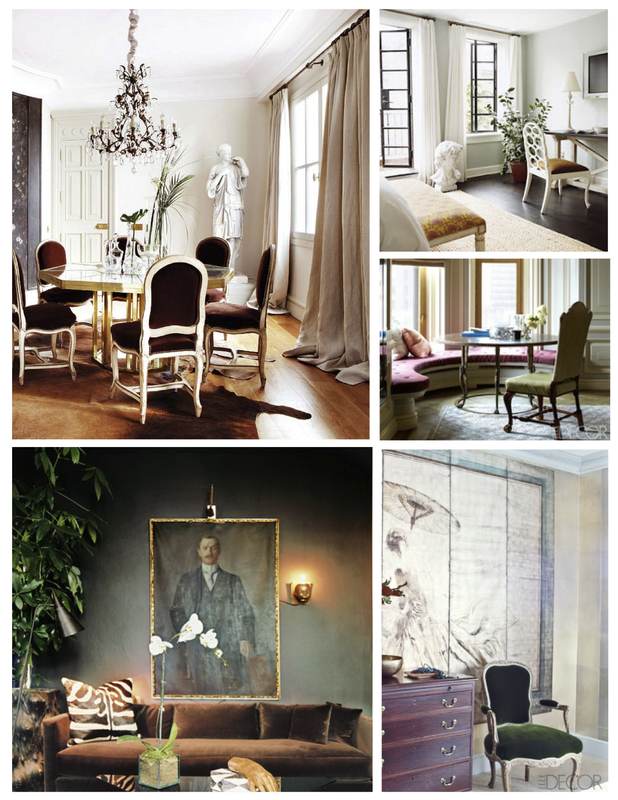 Seasonless in style with perhaps a boldness even in its faded form. 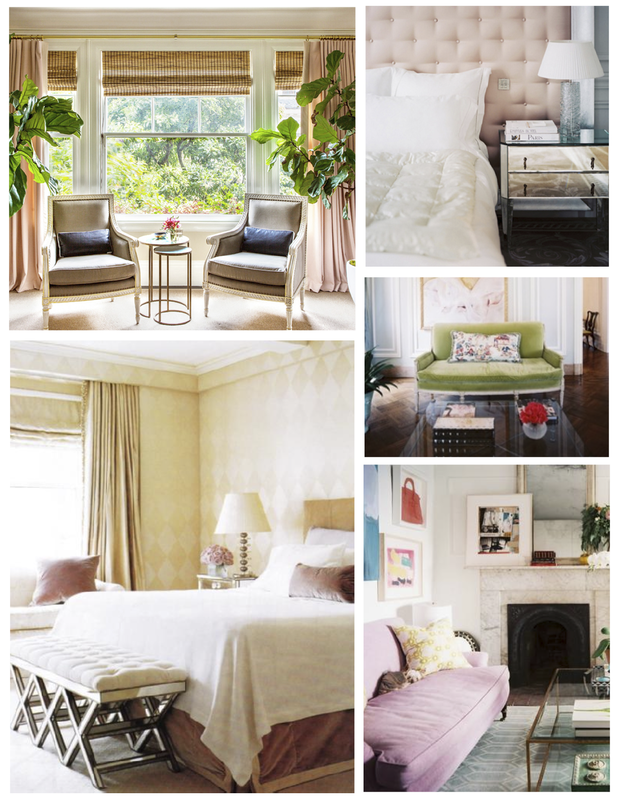 Pink is not for the timid yet its hue in our modern world of design offers an elegance of classic beauty with a modern edge. I’ll blush to that. 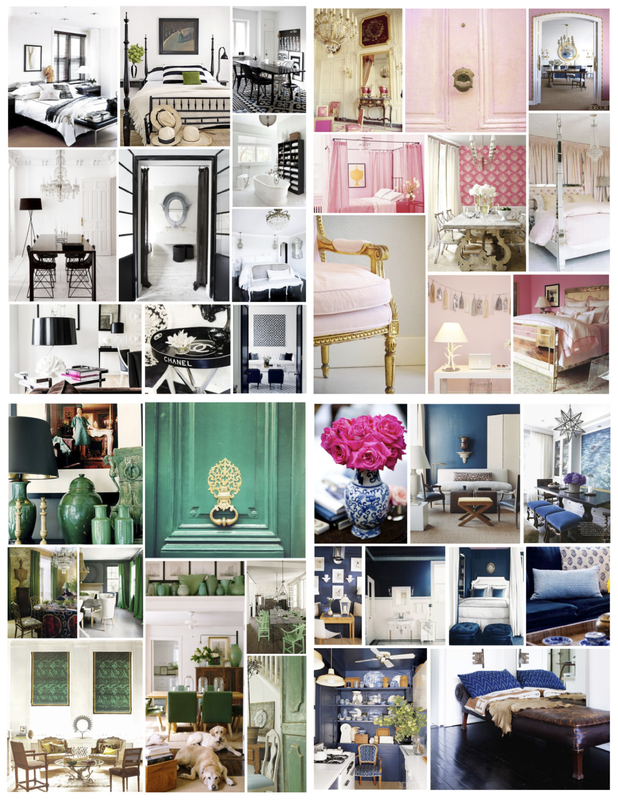 Enchanting Hues Of “Rose Gold”…. Golden Appeal. Perhaps there is something very striking of the color of gold as a New Year begins. Brilliance. 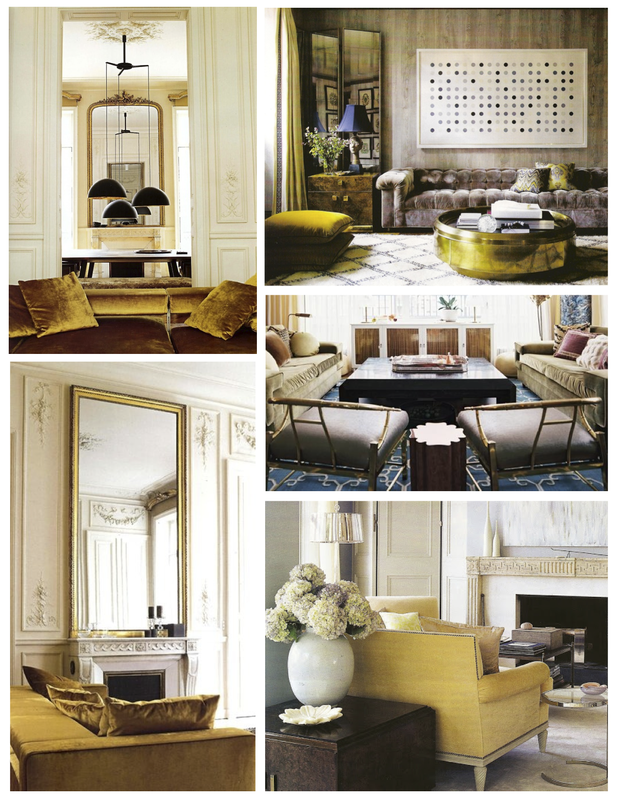 Yet another recurring focus upon golden hues within the interior (January 2013, Visions Of Gold). 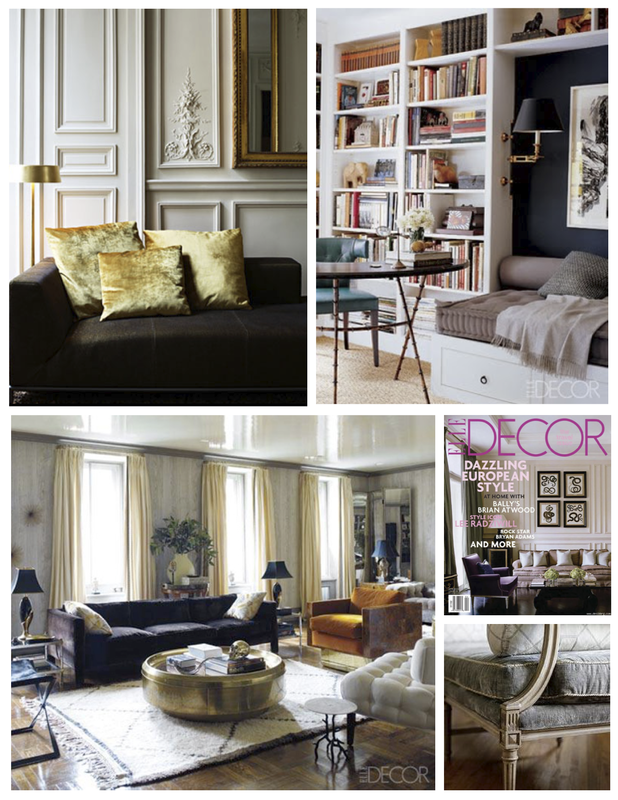 Yet the “gilded” appeal within the interior is striking at any time of the year. Timeless. Gold seems to offer a timeless richness. 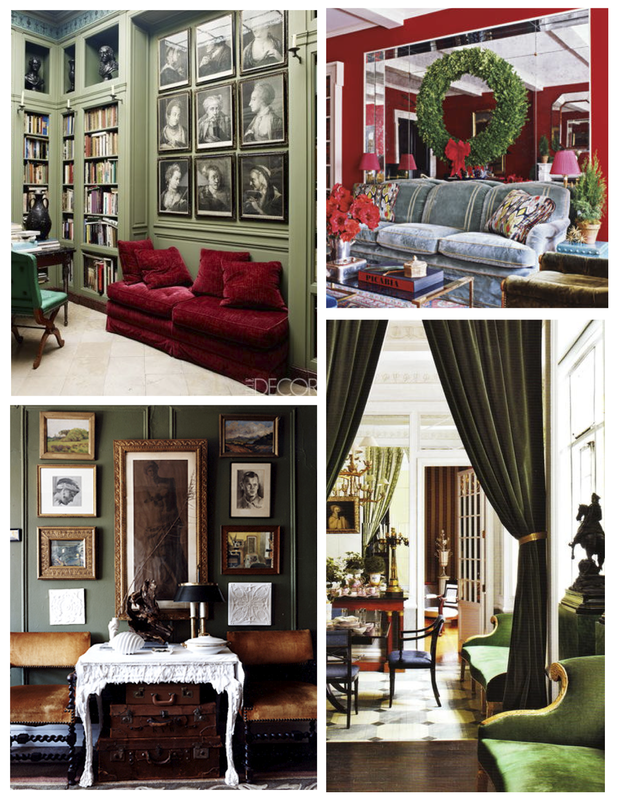 Perhaps the hue that has historically symbolized wealth and power offers more than a bold impact of rich visual appeal within the interior. An elegant appeal in a hue of gold that endures, indeed. 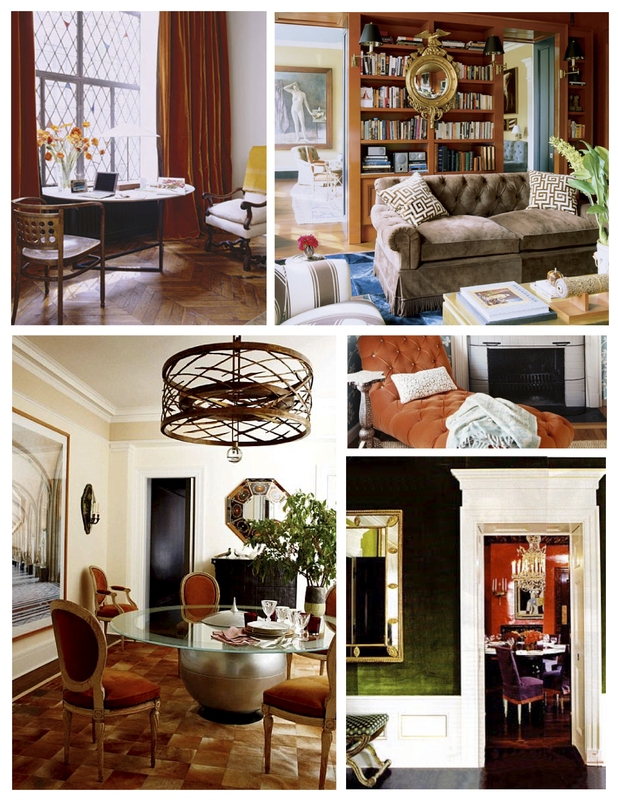 Consider the brilliance and striking visual of hues of gold and gilded delight within interior spaces. 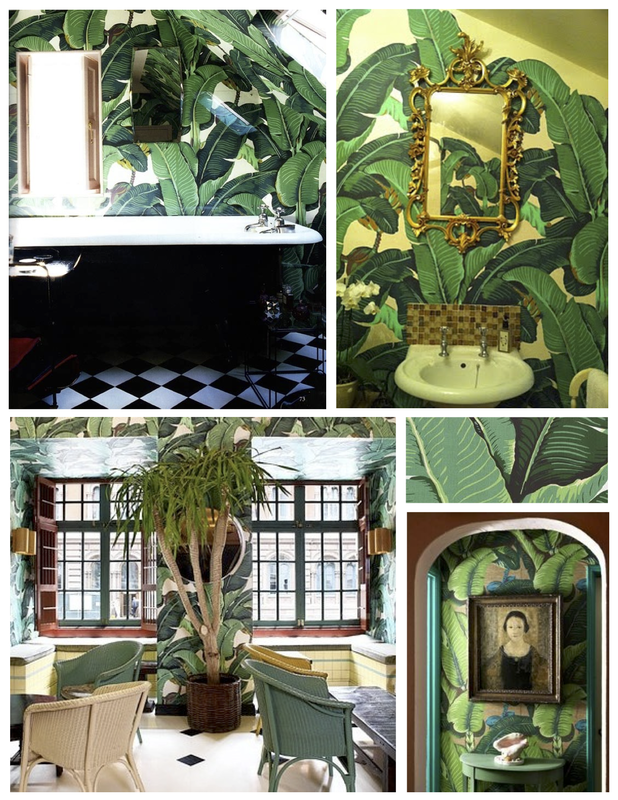 Certain to be appreciated as a timeless and classic hue of visual interest, the gilded appeal that graces interior worlds will continue to present a striking impact. Gilded inspiration of hues of golden delight. 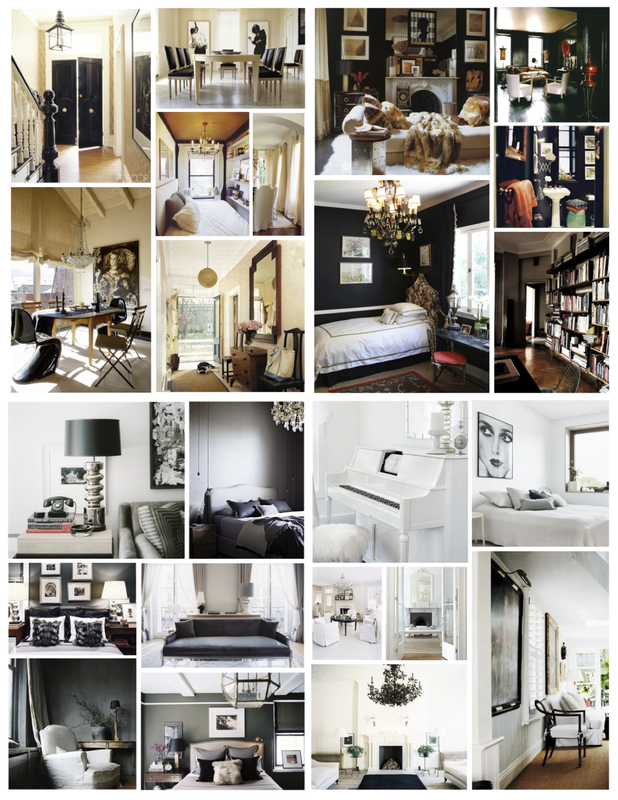 Stunning elegance and timeless appeal, indeed…. 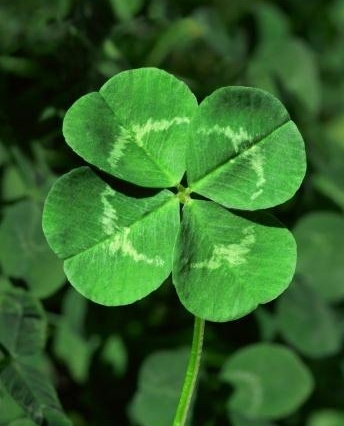 And of the ultimate symbol of “Good Luck”? 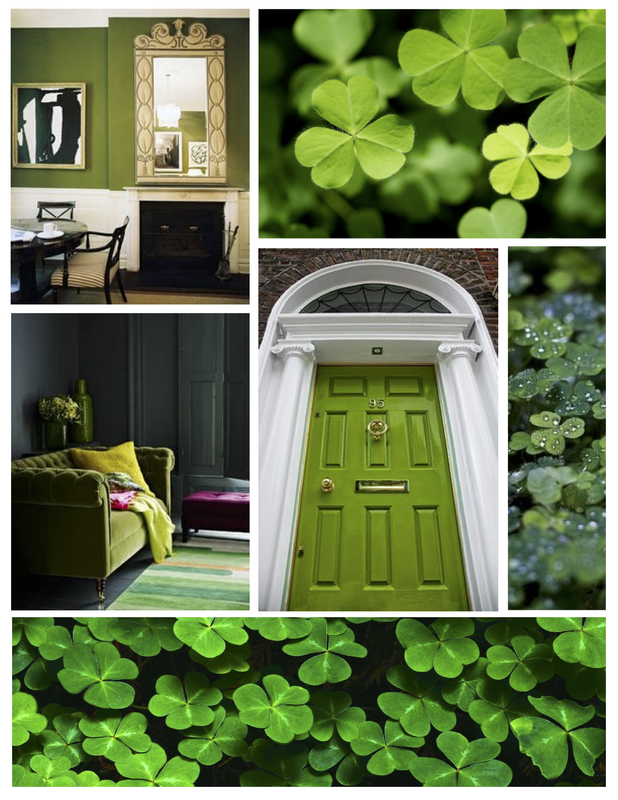 Ahh, the four-leaf clover…. 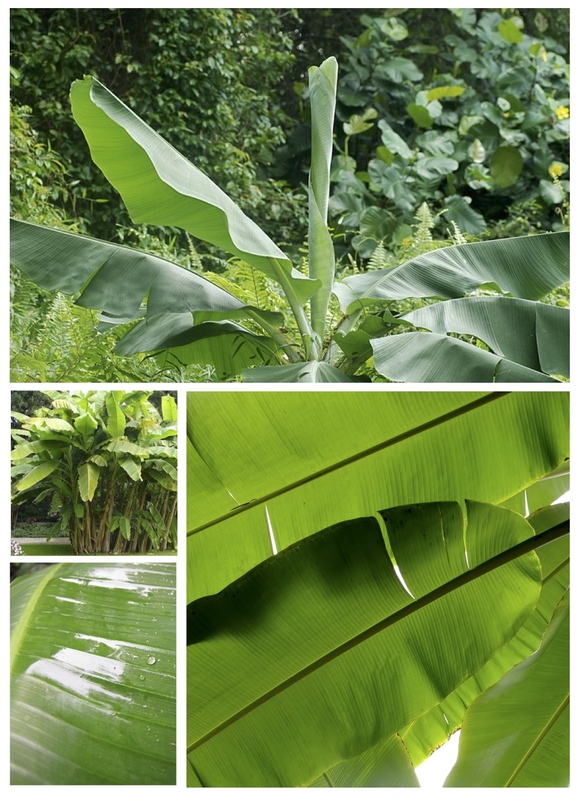 The Banana “Tree” is a fast growing, herbaceous perennial arising from underground rhizomes. A member of the genus Musa (part of the family Musaceae) it is believed that there are almost one thousand varieties! Imagine! Believed to have originated within the jungles of Southeast Asia, bananas are thought by some horticulturists to have been one of the first fruits of the earth. Who knew? The fleshy stalks of these glossy green plants are formed by upright layers of leaf sheaths that constitute as functional “false” trunks, which produce the leaves. The true stem begins underground, growing upward and pushing its way out through the center. 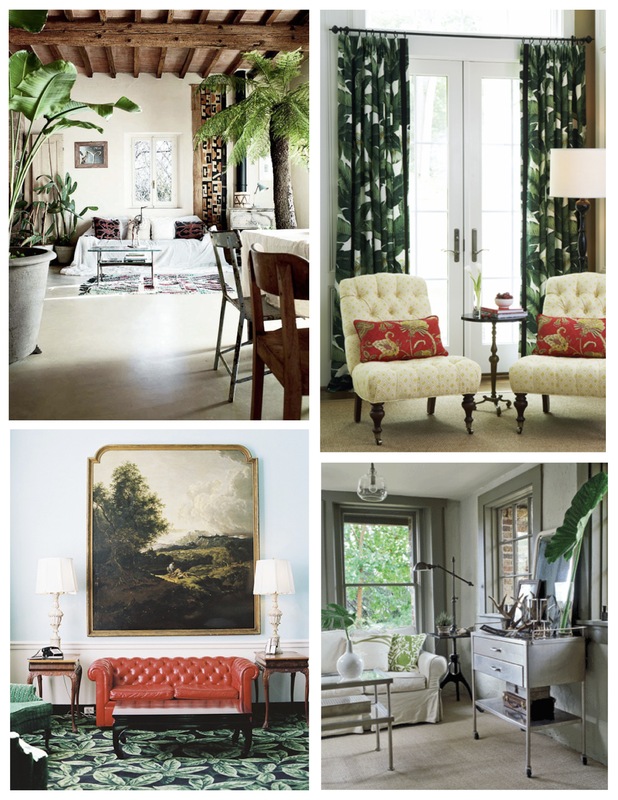 The glorious plant of nature arises to grace our world with its decorative and tropical appeal. 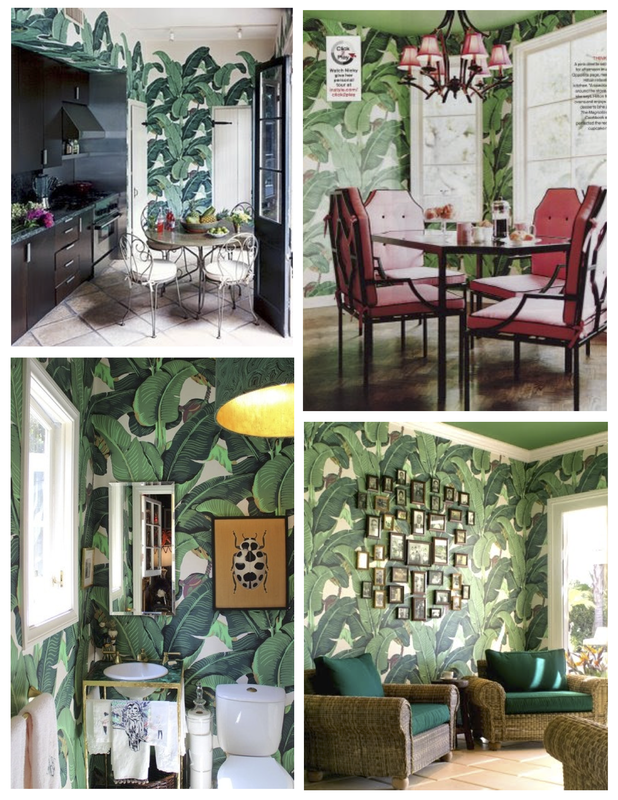 One cannot pay tribute to this glossy and stunning large tropical leaf without acknowledging the iconic patterns created by the artistic minds of two designers: Don Loper & Dorothy Draper. 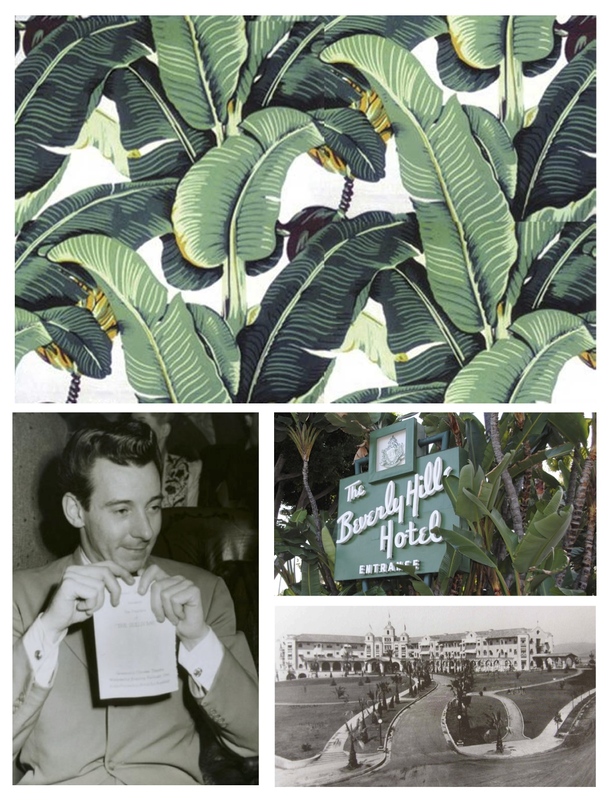 First, Don Loper’s iconic “Martinique” printed wallpaper that graced the walls of the Beverly Hills Hotel in 1942. Don Loper (April 1906-November 1972) was “an American costume and necktie designer, screenwriter, choreographer, associate producer, actor and an assistant to MGM musicals producer Arthur Freed“. His talents varied, his creation of this distinctive pattern endures to carry his name onward. Considered one of the most recognizable patterns in the world, the original “Martinique” Banana Leaf paper was hued in colors of burgundy, muted green & deep mustards with a hint of brown. 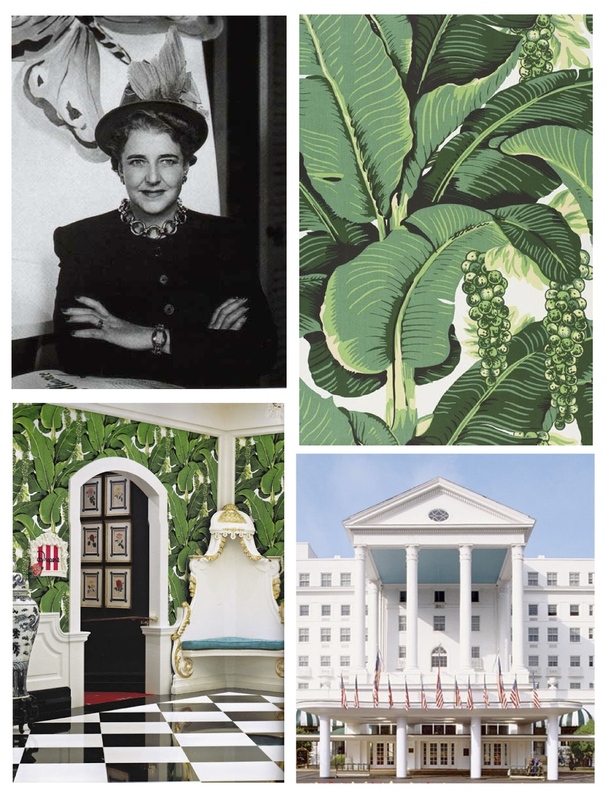 A timeless, bold and exaggerated pattern of distinction that has rightly earned its place as one of the most iconic wallpapers within the history of the 20th century. Timeless, for certain. 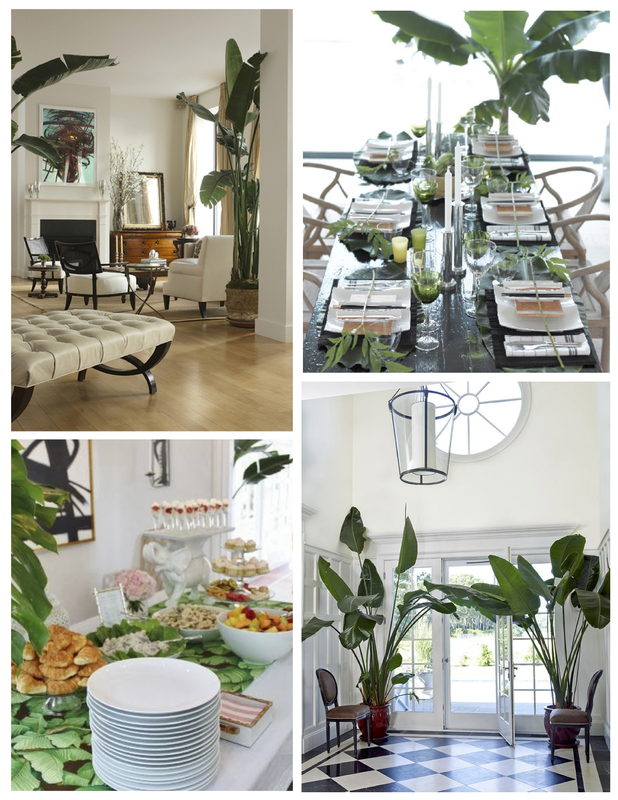 Consider the beauty of the banana leaf. 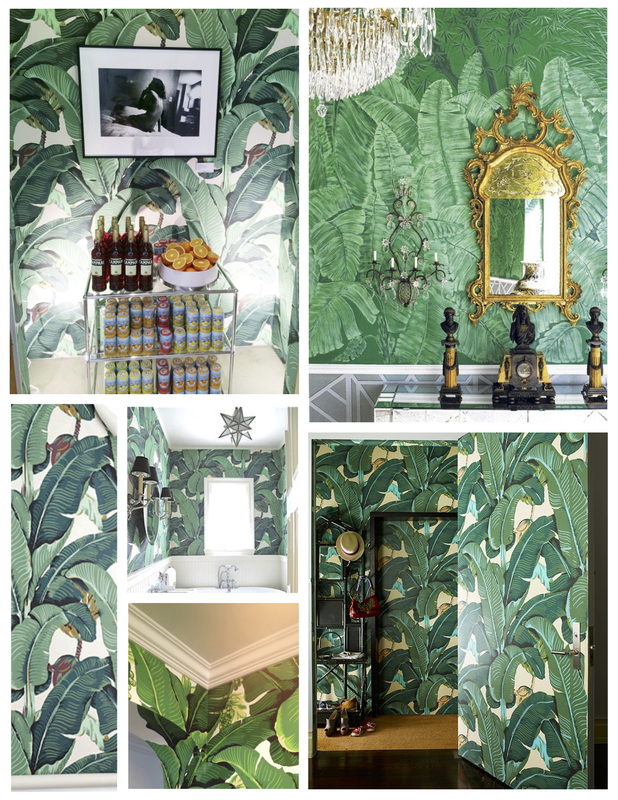 The bold pattern of distinction of the graceful banana leaf endures even in the realm of the fashionable world. 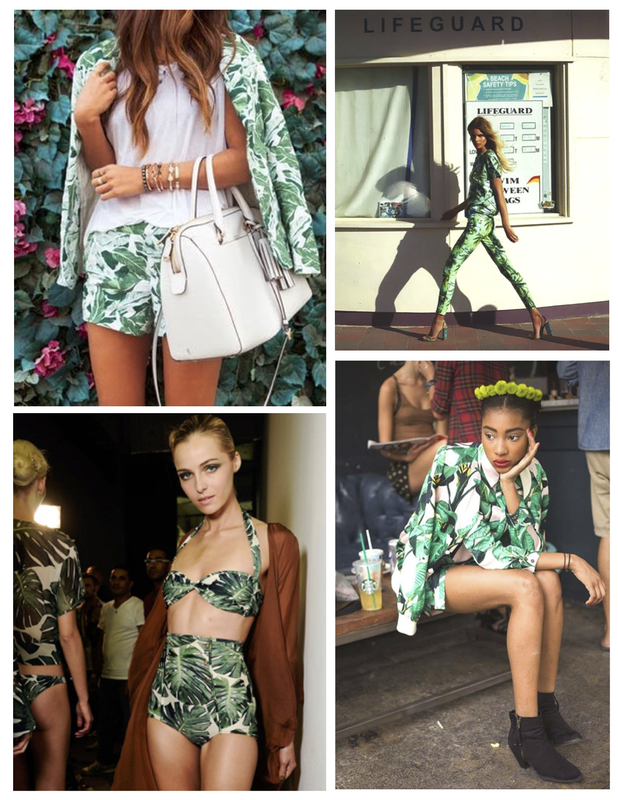 Alas, although we may not adorn ourselves with the patterned appeal of the striking, iconic patterns of the “Martinique” or the “Braziliance Palm” , an appreciation of fashion’s influence by nature and pattern is at hand. 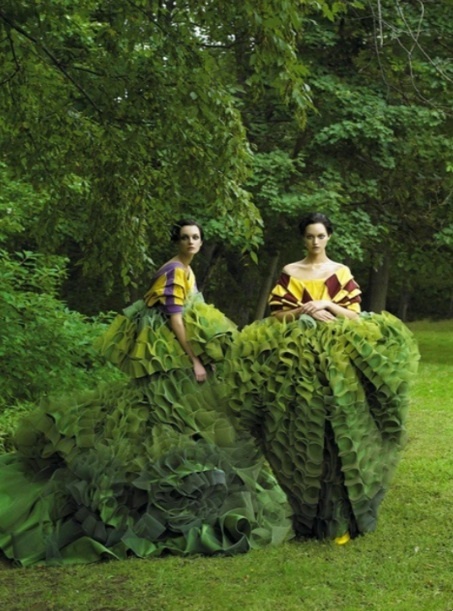 Acknowledging the longstanding influence of artistry in fashion, indeed. 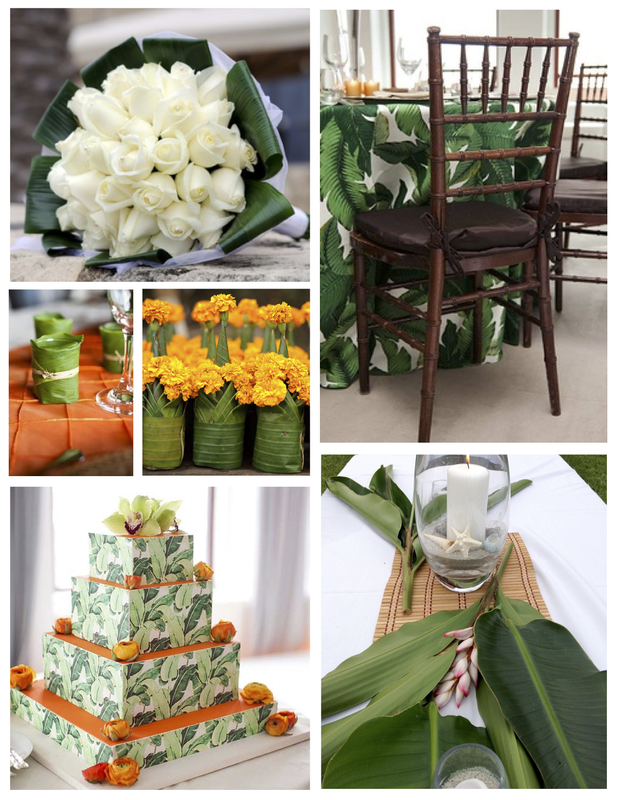 And of the addition of the banana leaf at weddings and events? 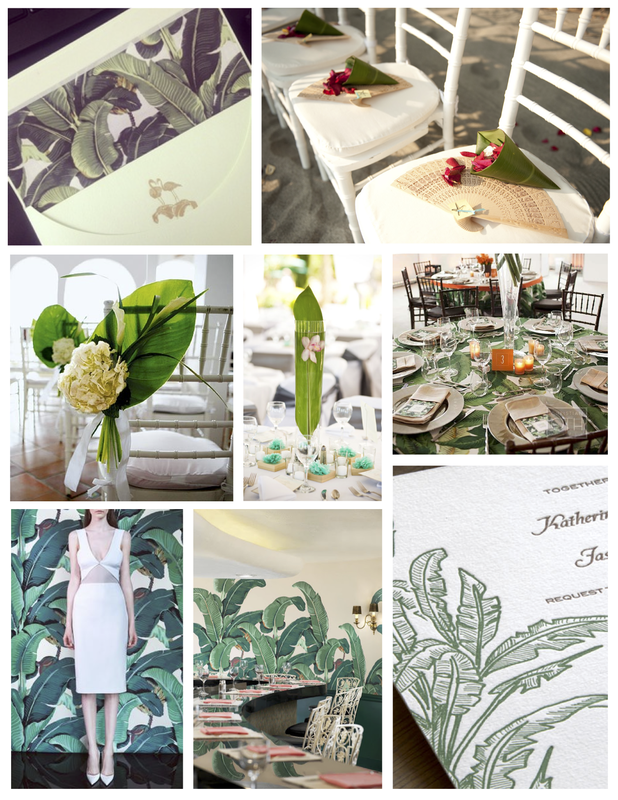 The glossy leaf of tropical appeal brings with it a memorable appeal of celebration. Tropical delight. Perhaps an brief understanding of the reason behind the creation of this quiet luxury is in order to further appreciation if your interest is piqued…. Beyond Rhodes appearance in 2008 on Martha Stewart’s television show and the countless accolades of merit the company and Lee Rhodes would obtain, it is her gift of hope that endures to gain attention. 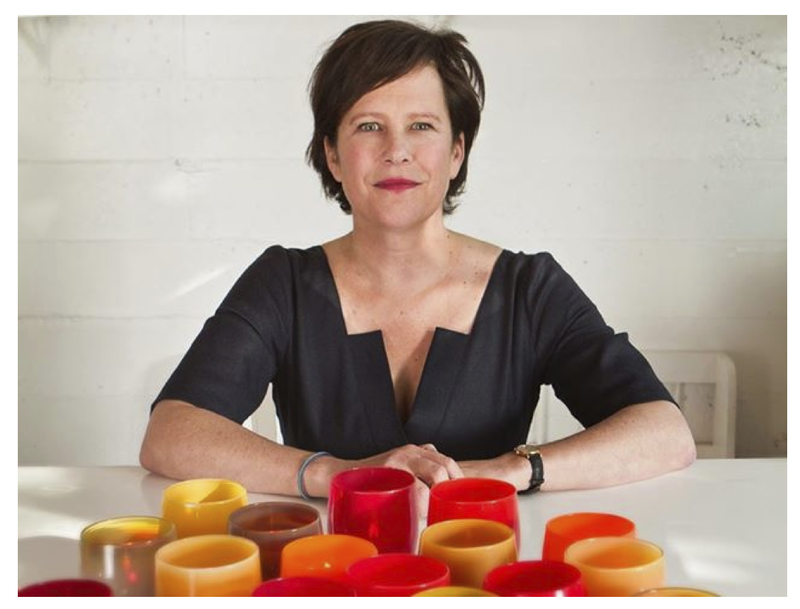 By 2011 glassybaby had donated more than $600,000 to various charities, following Rhodes goal to donate 10% of all sales to charities helping cancer patients with costs during chemotherapy. 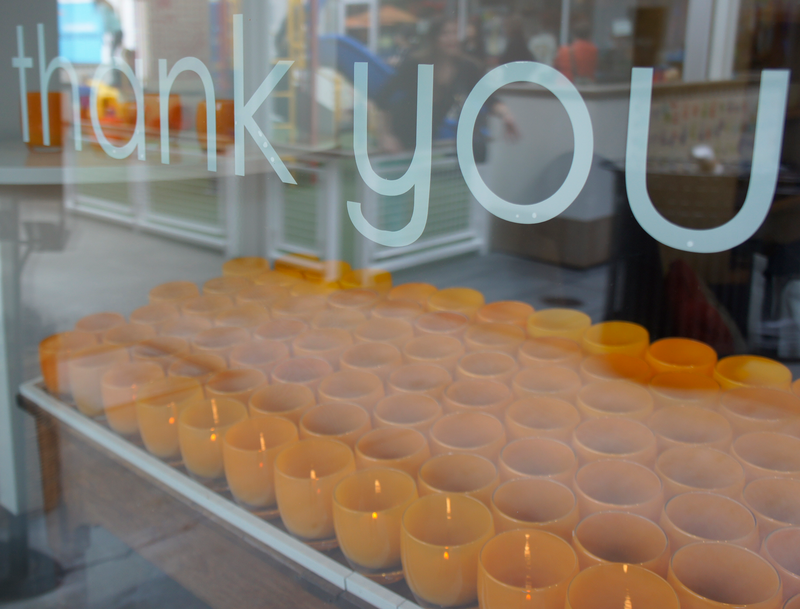 glassybaby has since surpassed its one million donation goal to charities across the country and aims to reach “one million more”. Imagine! Quite an intent of hope. Beauty paired with giving. 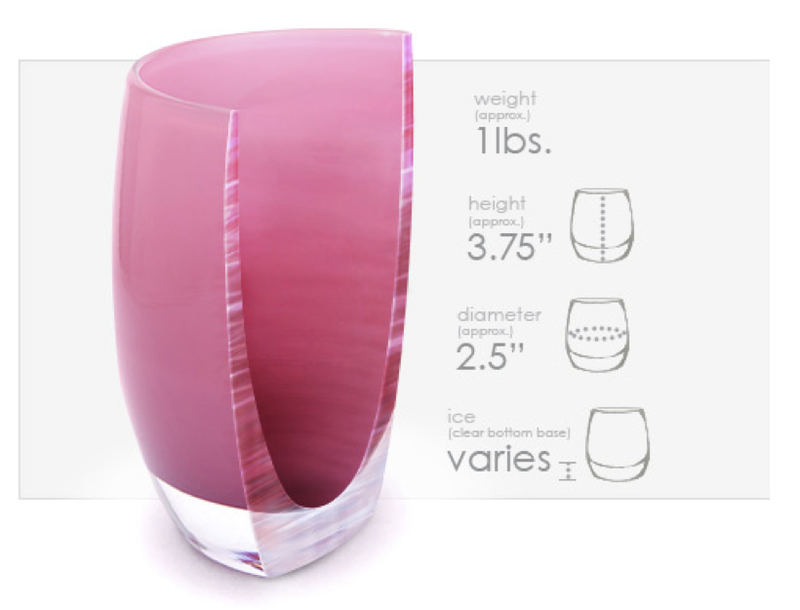 The original glassybaby is a glass votive, roughly 2.5″ in diameter and 3.75″ tall. Given the fact that each is handmade, variations of distinction certainly are bestowed to each vessel of hope. 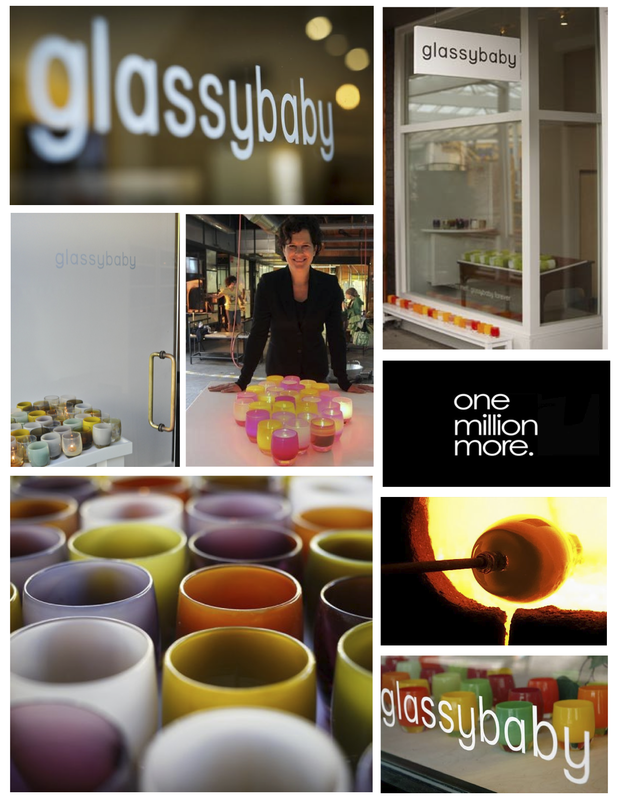 Of interest, to produce one glassybaby is said to take approximately 12-14 minutes by a team of glass artists. Quality in craftsmanship, indeed. 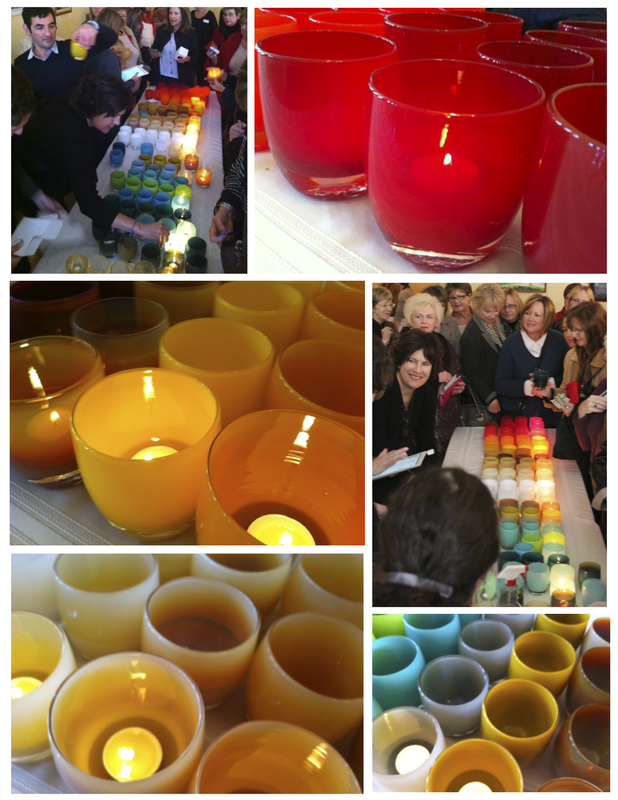 The “team” that create these glowing vessels comprise of over 70 artisans. 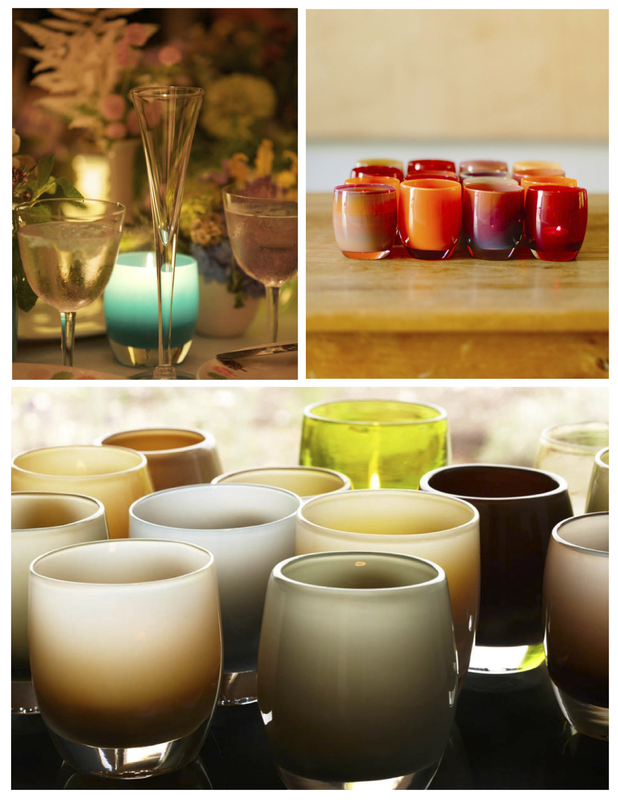 Four artisans and three layers of glass per glassybaby. Imagine. That said, beyond a molten ball of glass on a blowpipe, consider the time, the energy and artful talent of glassblowing that each vessel holds. The beauty of an art form. Beyond the skill and time taken in the creation, it is interesting to note that the European color rods used (which are lead free) are said to be derived from elements of nature, the “recipes” of some of which are stated to have endured for centuries. History and the colorful glow of an art form. In November of 2013, I had the pleasure of meeting Lee Rhodes. Her appearance in our quaint, Northern Illinois town of Woodstock was part of the Woodstock Fine Arts Association’s, Creative Living Series at the historic Woodstock Opera House. Of note, Lee was part of the same series and stood on the same stage that Martha Stewart once stood and presented. History. At the time Lee Rhodes presentation took place we were celebrating our 50th year of a series of inspiring and acclaimed speakers. Another iconic moment for our series, indeed. Her story was expressed so simply and naturally. Sincerity. Warmth filled the air as we journeyed with her through her shared story of hope. 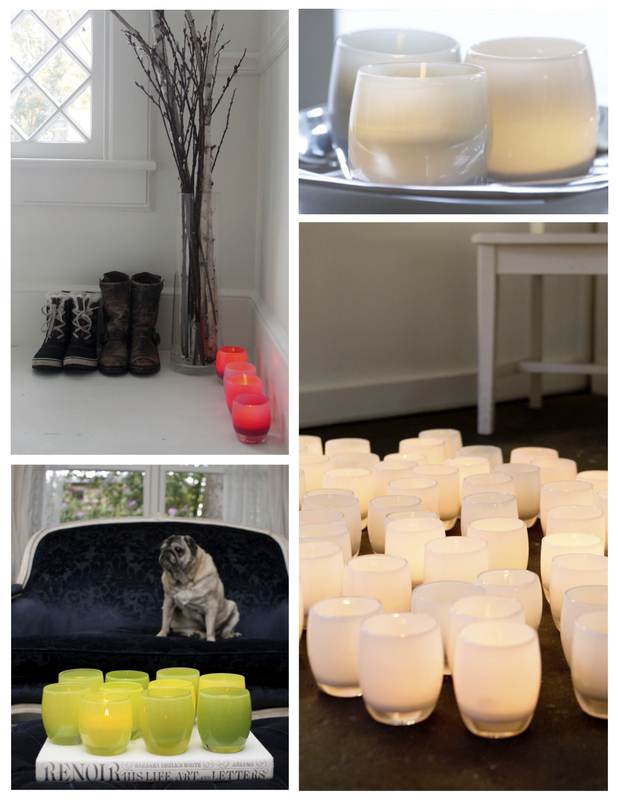 Afterwards, the delighted audience gathered closely around her and the amassed collection of her glowing vessels. 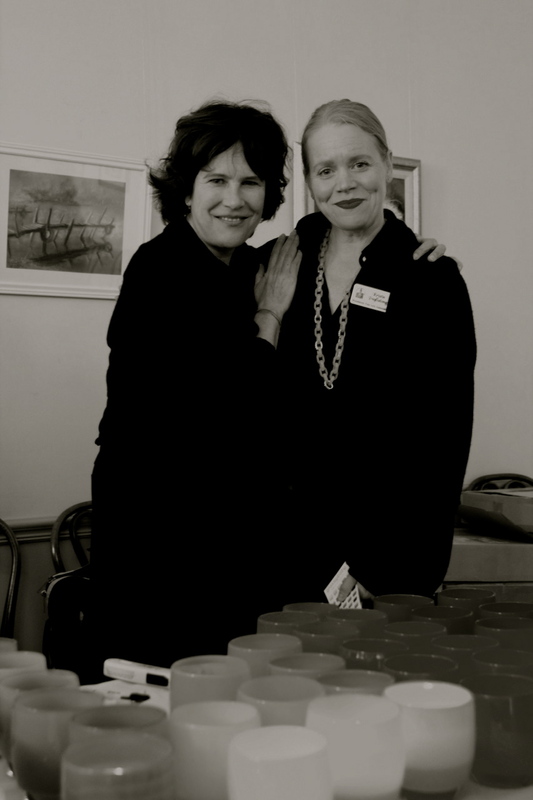 As a board member of the Woodstock Fine Arts Association, I had the pleasure and the opportunity to meet her and personally express my gratitude for her gift and my adoration for the hand blown vessel I had discovered years prior (And of my newest addition? deep lipstick red in color, of course!). But I must express the genuine joy and sincerity that glows from within Lee Rhodes and spills outward for all who surround her. Pure joy. Upon meeting her and directly experiencing her spirit of hope and joy of life, the impact and my appreciation of her glassbaby’s have deepened. 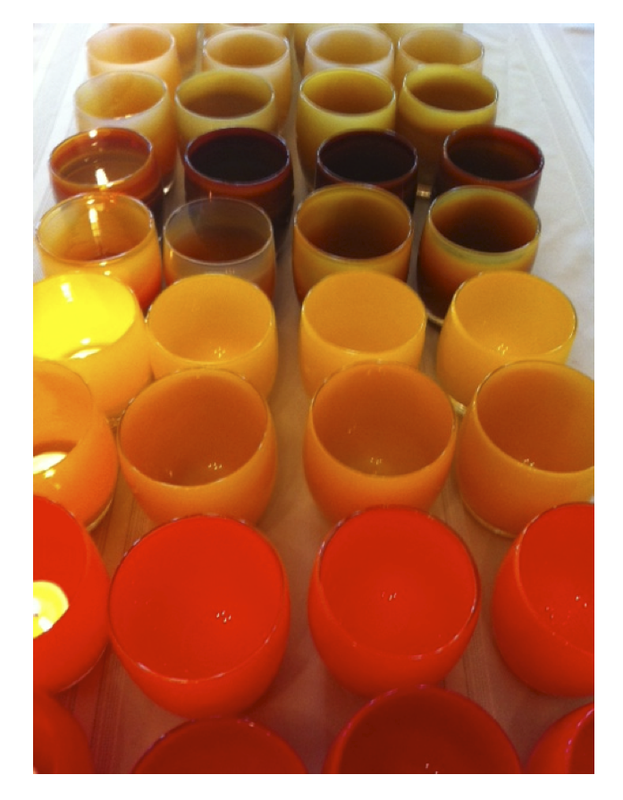 Her joy and effervescence of life is within my interior when I light my vessels of hand blown beauty. Is there any better gift with our lives than to touch others with love? A flame that will endure. 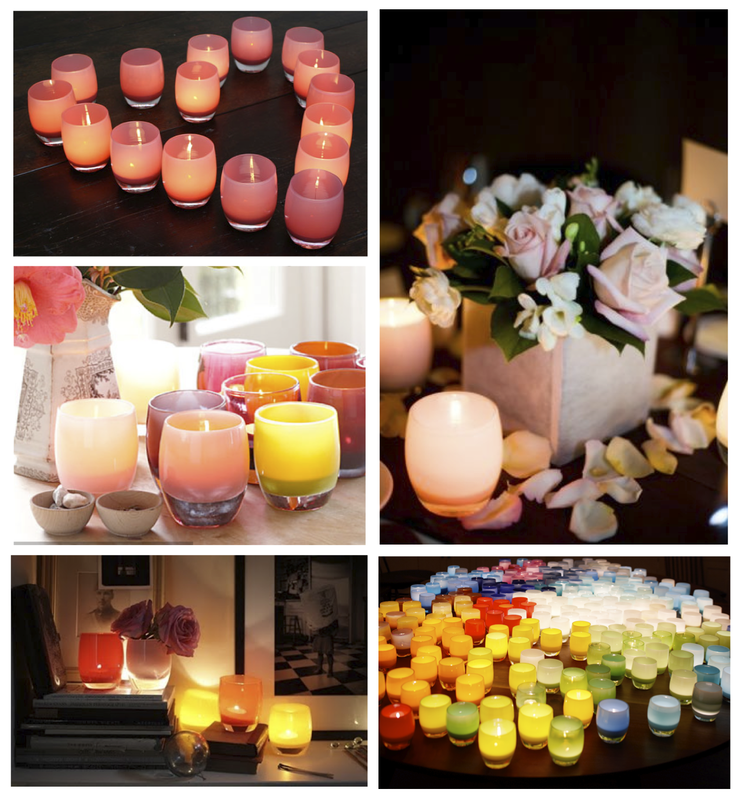 Indeed, the new tagline for these vessels of glowing beauty is just that: “glassybaby Forever”. For certain, it is also perfectly quoted as “One Of A Kindness”. Indeed. And of the glowing beauty of these vessels within the interior? Beautiful. 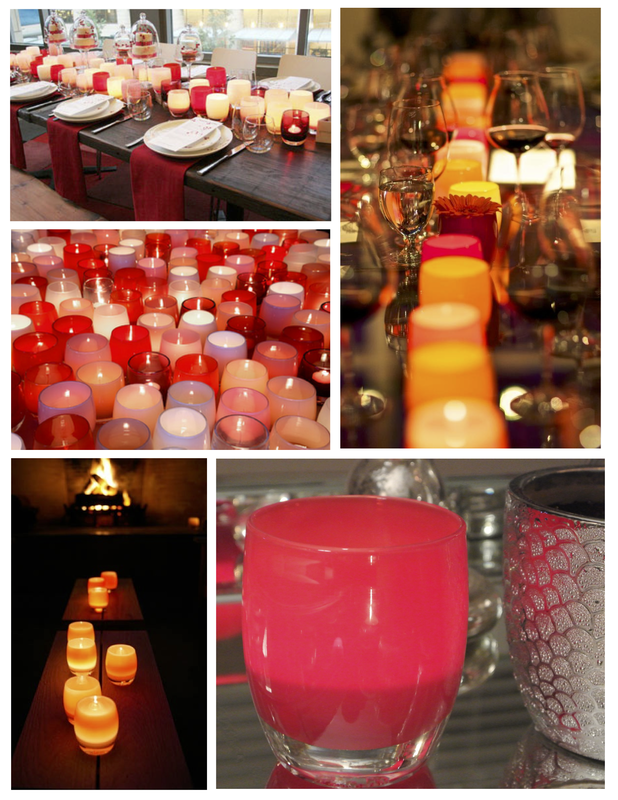 Whether a single glassybaby or a mass of glowing bliss, the stunning glow warms the spaces it fills…. 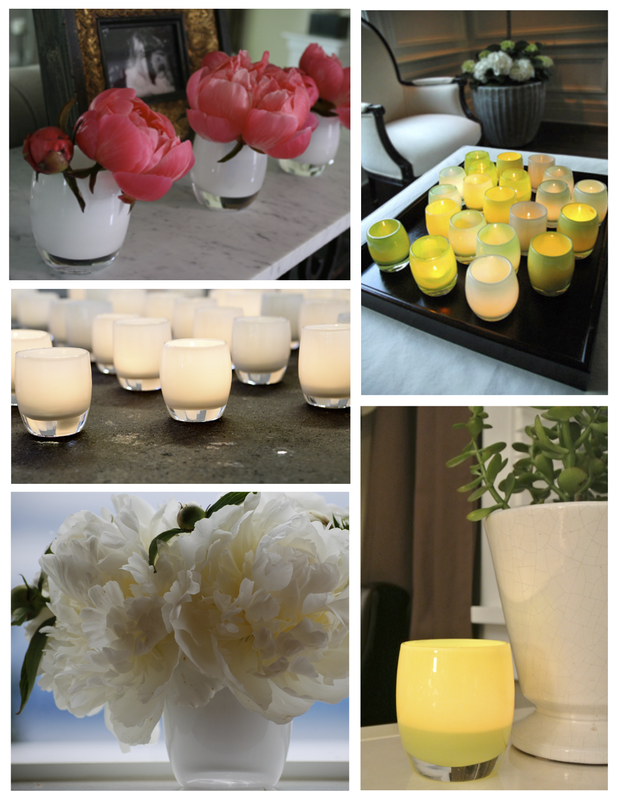 Fill your world with the beautiful glow at glassybaby.com. PS: To Lee Rhodes…Thank you for your glowing gift of enduring hope and love. 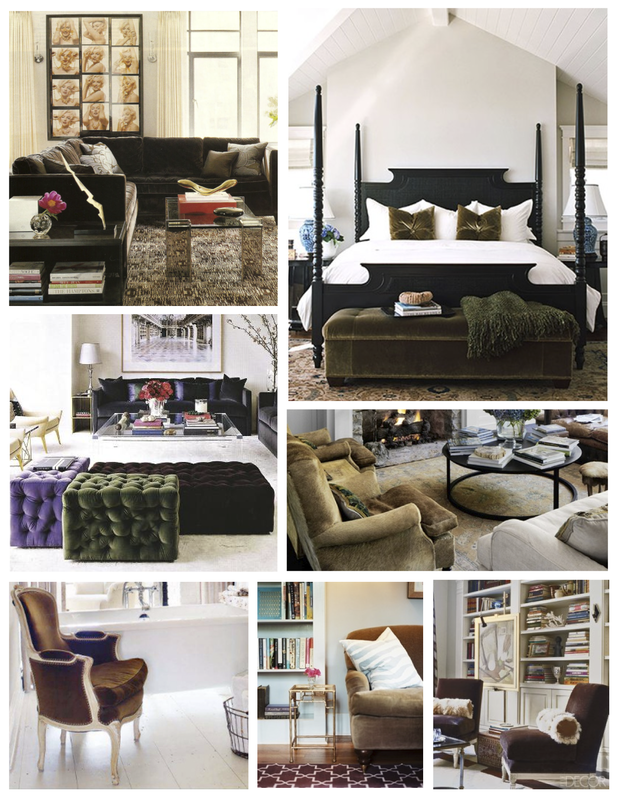 The term “Velvet” refers to the “weave and pile made of silk thread”. 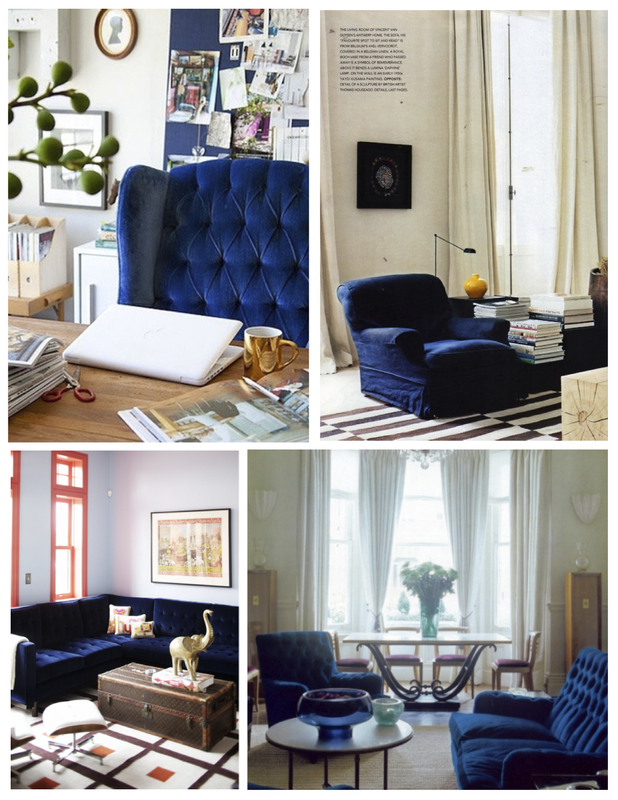 Velvet is described as “A type of woven, tufted fabric in which the cut threads are evenly distributed, with a short dense pile, giving it a distinctive feel”. Velvet is also known as a “warp-pile fabric” which means that is has “one set of filling yarns and two sets of warp yarns. The second set of warp yarns can be cut or uncut”. And then of course, a more elaborate description: “Velvet is a warp-pile fabric, meaning that is woven with one set of weft (horizontal) fibres and two sets of warp (vertical) fibres, the second set of which are evenly cut to create the distinctive soft pile. Velvets are woven on a special loom that weaves two layers of fabric, one above the other, that are connected by the extra set of warp threads; the warp threads are then cut to produce two sheets of fabric that are wound up on separate rolls.” Complicated yet interesting. The glory of a fabric and the craft of weaving it. Of note, the word “Velvety” is used as an adjective to mean “smooth like velvet”. Smooth, indeed. 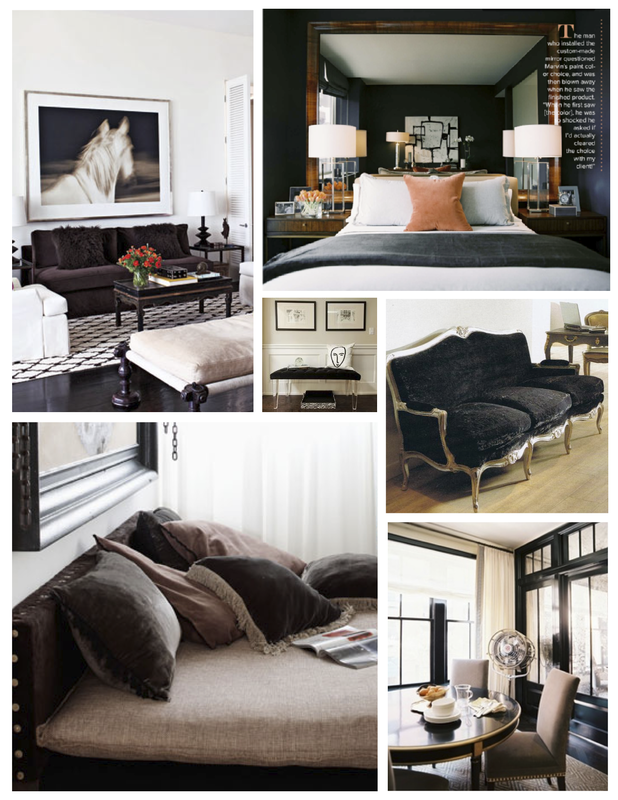 Traditional silk fiber velvet denotes the utmost luxury in a fabric layered within the history of textiles. History states that the Egyptians used a technique with looped pile similar to the one that is utilized in velvet production. Who knew? 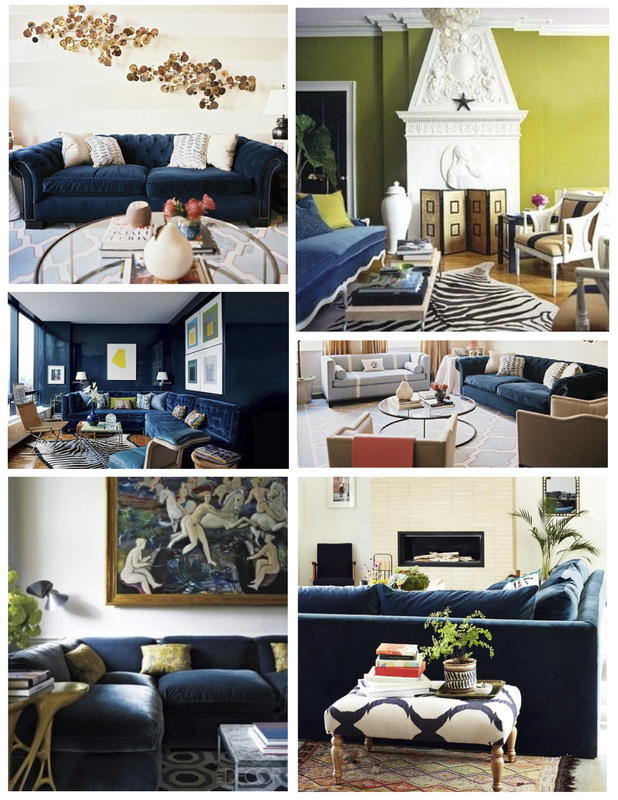 Throughout the centuries from the Medieval era through the Renaissance and beyond, the appeal of velvet has never faded. Of interest, it was during the Renaissance that the luxurious fabrics of velvet were made of silk and precious metal threads. Thus velvet was perhaps among the most valuable items owned by the individuals who layered in these rich fabrics as well as the churches that were adorned with palatial velvet within their enclosed spaces. Alas, it was the upper classes, royalty and nobility, who owned garments and layerings of plush velvet. 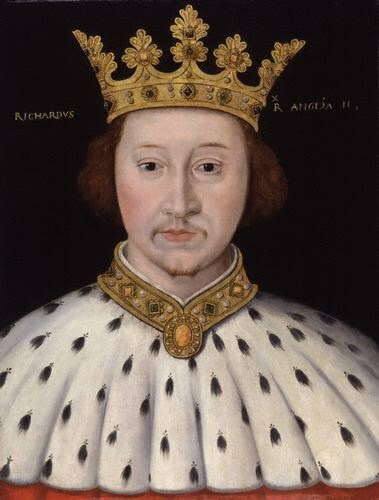 In fact, in 1399 King Richard II of England declared in his will that his body should be clothed in “velveto”. Royal luxury defined. History finds that between 1400-1600 European artistic velvets were woven by weavers of the Italian peninsula (including Lucca, Genoa, Florence and Venice) as well as Spain. 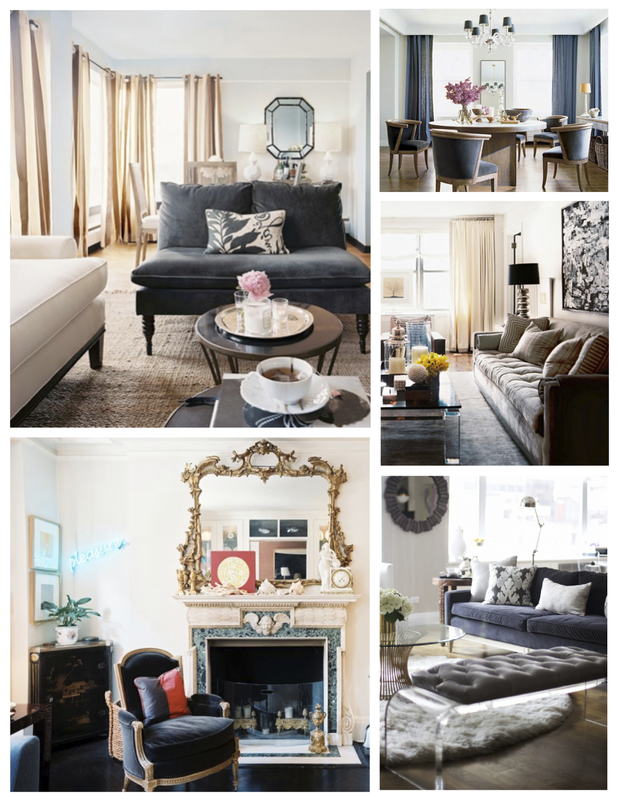 Spain is said to excelled at weaving patterned velvet textiles. Of note, Venice, Florence and Genoa are stated to have traditionally been recognized as the Italian centers of high-quality velvet production. During the mid 15th century, Milan’s silk industry was also recognized with its importance in the production of velvet. The art of velvet weaving would eventually pass to the artistic hands of Flemish weavers. In fact, during the 16th century Bruges attained a reputation for velvets equal to the works of the great Italian cities. The world of textiles expands, indeed. With the allure and demand for this woven textile of extravagant and grand design, it was the seaports of Venice and Genoa which would provide availability abroad in both Western and European markets. Merchants are said to have searched for the most brilliant shades dyed with the highest reliable dyes available (which would not fade with time or with light exposure). Oh, the lure of the rich colors produced of this luxurious fabric! And of the perennial favorites of that time? 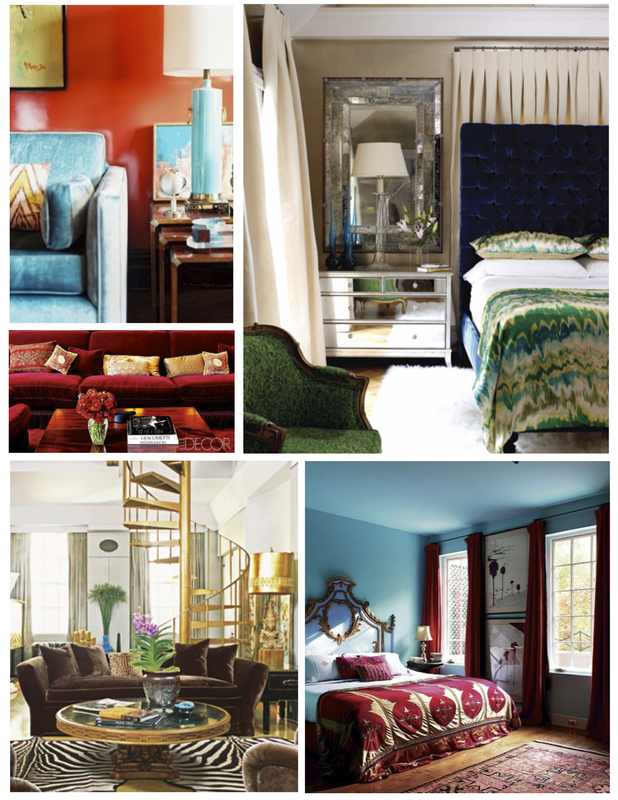 Crimson red, bright green and ‘sapphire’ blue. Timeless, indeed. The sumptuous and rich fabric of Velvet can be made with the traditional silk threads, natural fibers or synthetic fibers. The types of velvet are “Cut Velvet” (the most common type with a plan weave and a cut pile), “Crushed Velvet” (Pressing the fabric or mechanically twisting the fabric when wet), “Devore” (A process that dissolves part of the velvet leaving sheer areas of fabric), “Embossed” (A metal roller heat-stamps fabric to create a pattern) “Hammered” (A dappled and somewhat crushed lustrous effect), “Panne`” (like crushed, forcing the pile in a single direction by applying heavy pressure), “Plain” (commonly made of cotton), “Silk” (Shiny, soft and most expensive form), “Velveteen” (imitation velvet and weft-pile fabric with a shorter pile made either of cotton or cotton and silk) and “Velour” (Cotton fabric with a deep pile and heavier weight commonly used in upholstery and draperies). Alas, perhaps the velour fabric is the textile which drapes our world today. 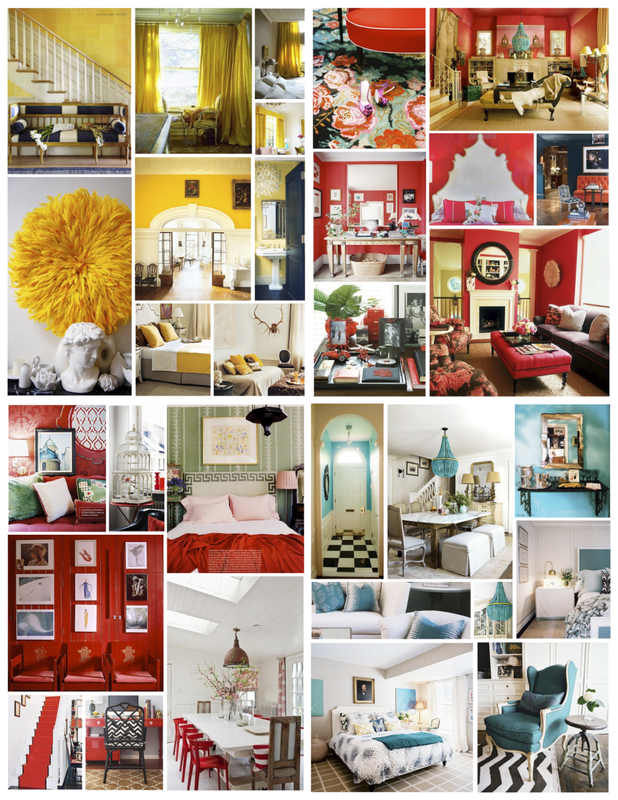 Cheers to “color” within your interior! Consider white. 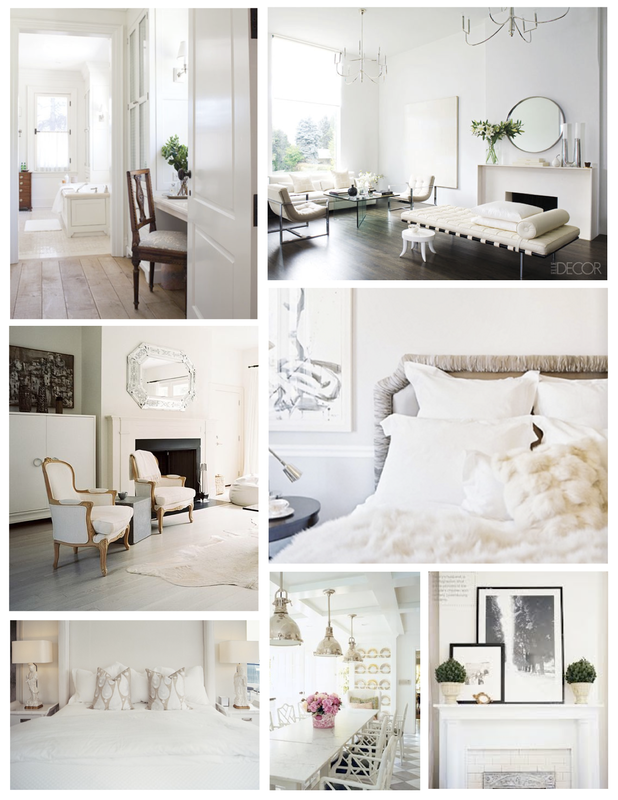 An all-white palette perhaps adds a Wintry spin to our spaces. 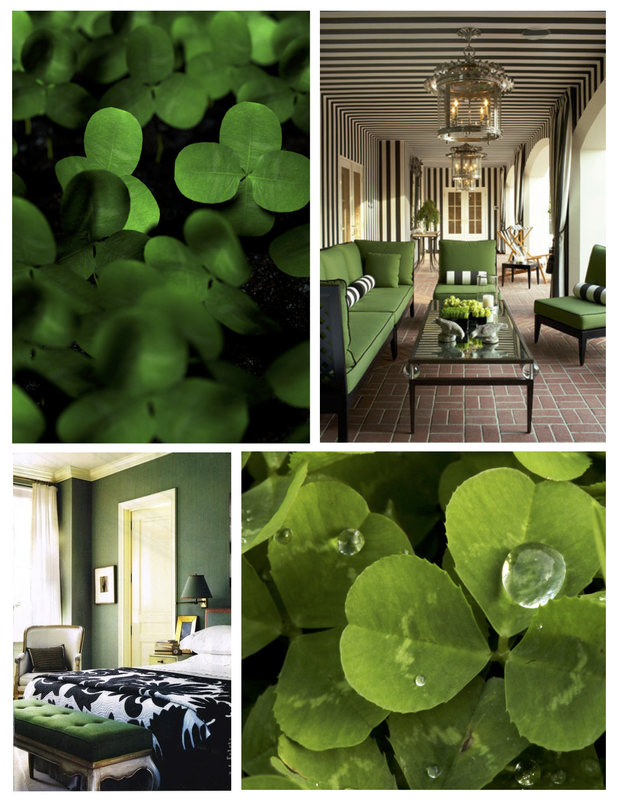 The elegance of this stark, crisp and yet serene color can provide a clear and deliberate focus for our spaces. Ethereal elegance. Classic, sharp and clean. 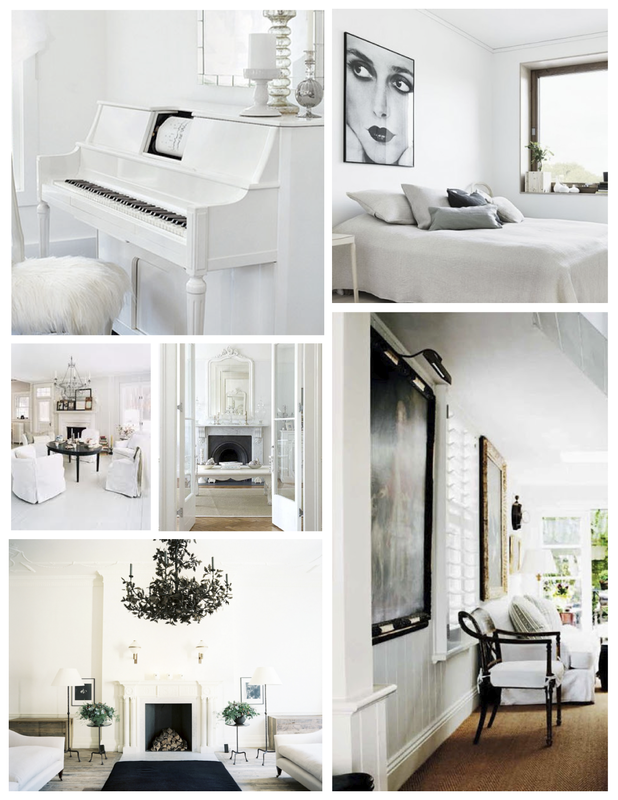 Blanket your spaces and gain fresh clarity with the pure color of white. 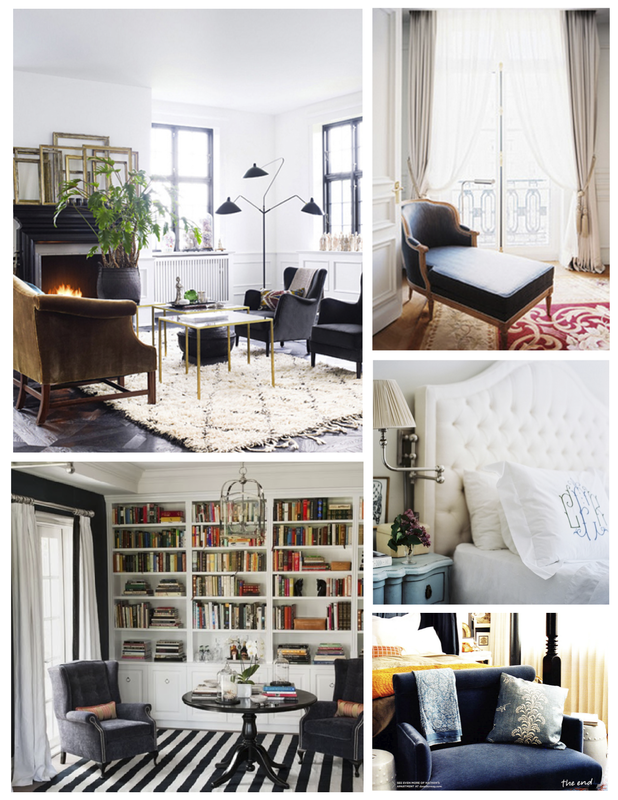 Whether you view the white interior as coated in a fresh “blanket of white” or a cool retreat and haven within Summer’s heat, the bold layering of a white interior provides a pure and sharp contrast of style. 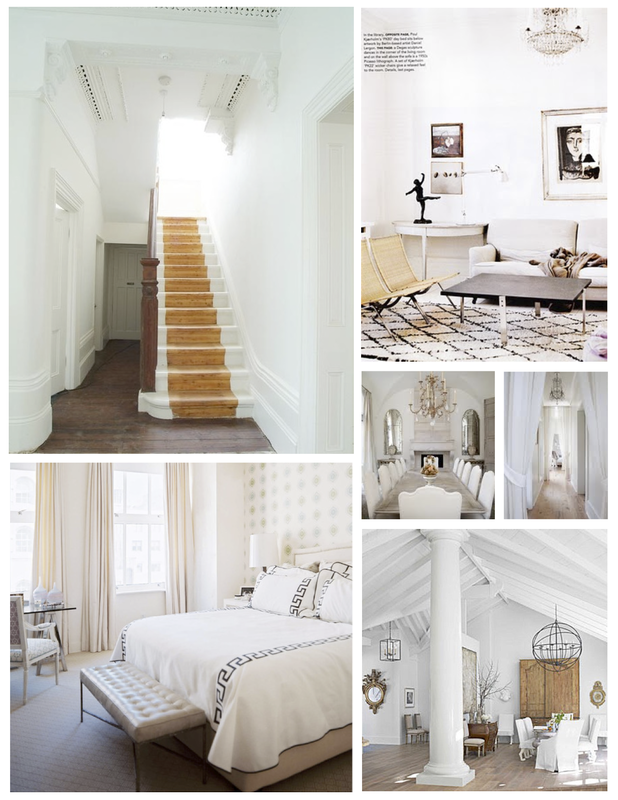 Pure white style, like fresh snow. 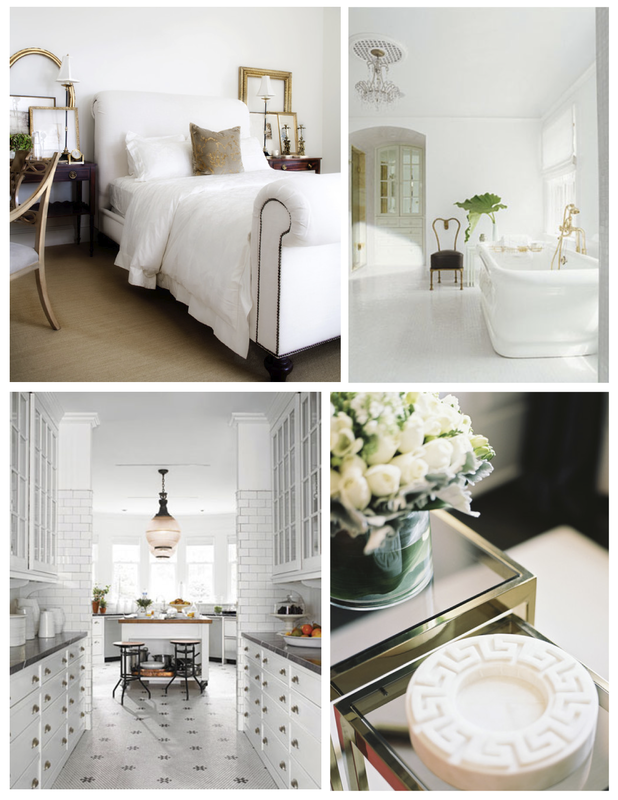 Classic and crisp “Winter White”, indeed….